My Little Craft Things: Try It On Tuesday - New DT Member!! I have a special announcement to make today. I have been invited to be a member of the design team over at the fabulous challenge blog TRY IT ON TUESDAY! I was so honoured to be asked and thrilled about the idea of crafting along side such a talented group of artists! The announcement was made yesterday, and if you would like to learn more about me, you can find my introduction HERE. I have also added a "My Design Teams" page, where you can find all of my wonderful new teamies and links to their blogs. I sure hope you will go visit them and see what wonderful creations they have made! And now, my very first challenge as a member of the Try it on Tuesday family: RECYCLE IT. Here is my make! I call it my Die Box. I had been looking for something to use as my Die Box for a few weeks. I finally decided to refurbish an old wooden one I had that was just collecting dust in the closet. I have never done anything wood before, so this was a fun experiment for me. I have lots more pictures, but let me show you the before shots, so you know what I was working with. There is a funny story as to WHY is made a Die Box, but first, let me tell you how I made it. - I sanded it down, wiped it with a damp cloth, let it dry and painted it with DecoArt Crafter's Acrylic Tan Paint - 2 coats. Then I used some Titanium White paint and a crackle paint technique to give it an old vintage feel. - I had intended on stamping some flowers on it, but in a moment of severe 'foggy-brain disorder', I applied my first coat of Mod Podge Matte...then it was too late to stamp!! Grrrrr! Anyway, two coats of that and it was ready to decorate. 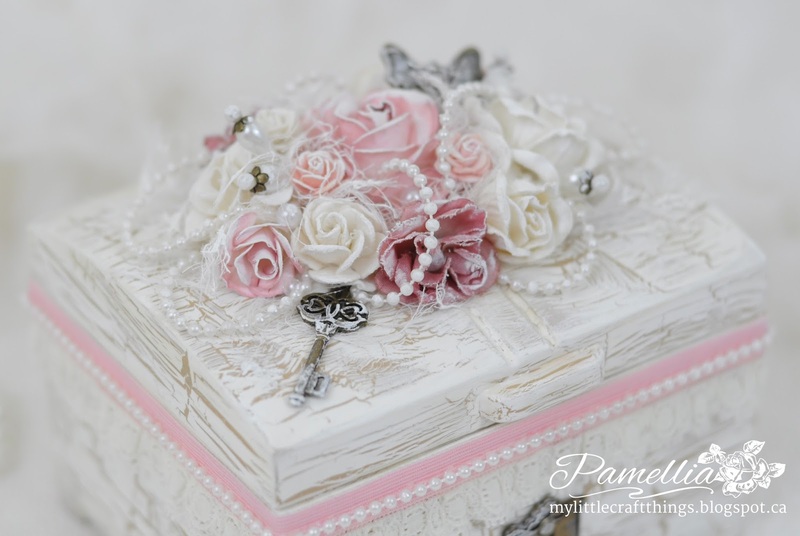 - the paper flowers were made using Joy Crafts Flower 4 and coloured with Tim Holtz distress inks Spun Sugar and Victorian Velvet. The fabric flowers were just hand cut and then dyed with Victorian Velvet. 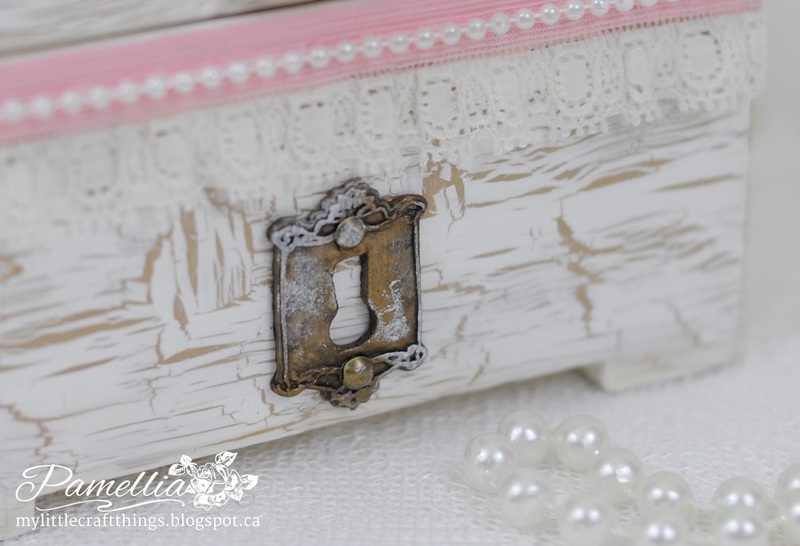 - I added some pretty lace trim and pearls around the edge, both from my stash. - they key hole was made with polymer clay and a silicone mold. I painted it with home-made bronze paint (a mixture of gold, black and green paints), then antiqued it with a black wash and added a couple of bronze brads. WHY DO I CALL IT MY DIE BOX??? A few weeks ago, I accidentally scooped one of my dies into the garbage when I was cleaning up. No biggie, I noticed it was missing, went through the trash in my craft room and retrieved it. Scolded myself, but did I learn my lesson...NOPE! Not a week later, I was spending the day cutting flower petals and leaves out of scrap paper, so I had about 10 dies out on the desk. When I was done, there were bits of scrap paper everywhere, I just took my arm and scooped everything into the garbage. I wasn't so lucky this time...the bag made it all the way out the door and to the dumpster! Two hours with my rubber gloves on, but I was able to get them back! I've never been so disgusted in my whole life...LESSON LEARNED! So now this box will sit on the corner of my desk. Every time I use a die, it goes straight from the Cuttlebug machine into the box, until after all clean up is finished. I will NEVER go dumpster diving again!! - I cut the frame from Spellbinders Decorative Labels Eight and painted it bronze. I lined the box with some stiff felt sheets, cut to size. The mini roses are from Wild Orchid Crafts. - The sentiment was done by hand with an alphabet stamp set from Studio G and it's a gentle reminder to myself that disorganization has unwanted consequences. ha! Beauty! Beauty! with a purpose. Congrats Pamellia on your new post. Looking forward to some fab creations from there. Hugs. This is very beautiful and the flowers are amazing. 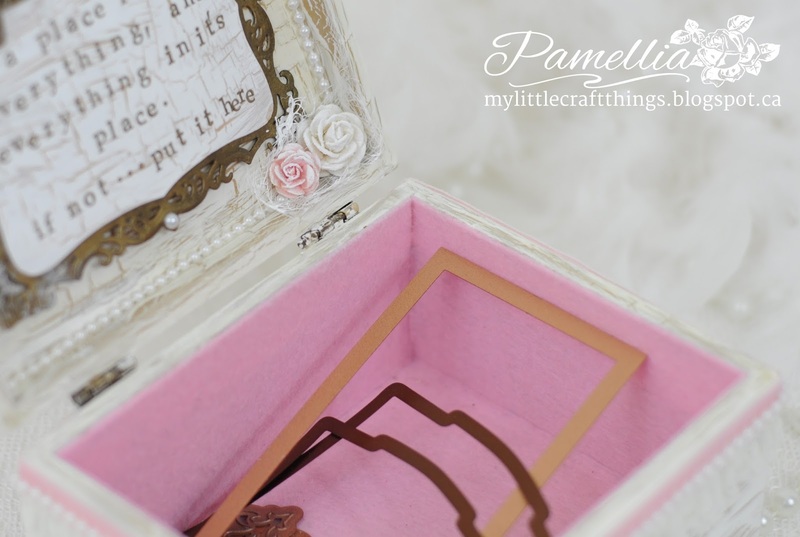 A great idea to keep your dies in a box that is so beautiful you can have it on show--mine are in a tattered cardboard box. Beautiful box! Love your crackle finish and the saying on the box, I have dropped a die in my recycle bin too! Great idea! Thanks so much for joining us at Sugar Creek Hollow! Totally lovely! I'd like to have it, so elegant and beautiful, Pamelia. Firstly,congrats on your DT place Pamellia....as far as I am concerned you should be on EVERY design team as you are so wonderful. 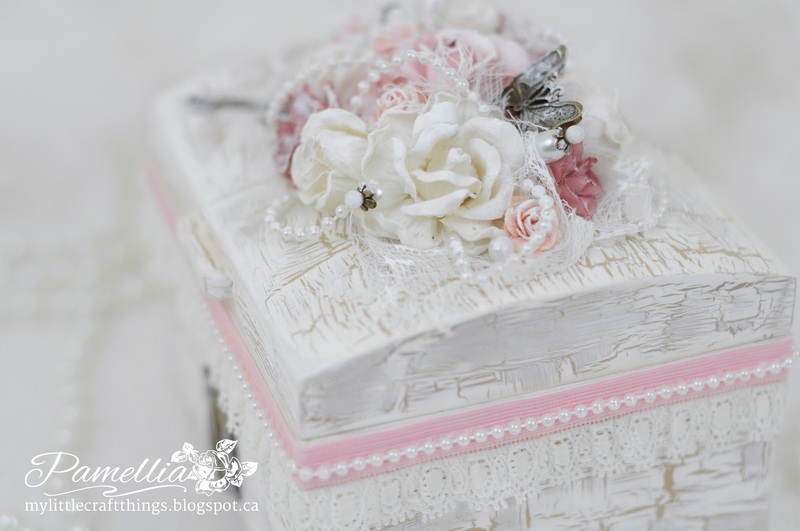 Secondly,oh how I love this,it's so soft and beautiful,reminds me of a slice of wedding cake and what a great use for it....no more dumpster diving now huh?? A lovely piece of altered artwork, so soft and delicate as well. Holy cow Samra!! You just put some bounce in my step with that wonderful comment! I think I will read it whenever I'm feeling down! Hi Pamellia, congratulations on another Design Team spot. What a beautiful box, and your handmade flowers look so realistic. It makes my battered plastic Lock 'n' Lock look very drab, going to have to remedy that. Hope you are having a good day. Sally D.x. Wow, beautiful work, absolutely stunning!! Hi Pamellia, it's lovely to have you on the Team and with such a lovely first piece. Love the finish on the box - and those words - just brilliant! Congratulations on your new team - well deserved, I'd say. Love the transformation of the wooden box. The colour palette is so pretty. I have a similar wooden box sitting in a closet so you have inspired me to do something with it in the near future. Gorgeous altering. Beautiful details and so feminine. We are thrilled to have you join us at TioT's. Blimey O'Reilly as they say on this side of the Atlantic! Stunning, stunning and did I say, stunning? I keep my dies on magnetic sheets in a photo album so I just take the sheet out of the plastic pages and keep popping them on and off the magnetic sheets. How dull is that compared to having a die box? Every craft desk should have one! Time for bed here but enjoy your evening. Your altered box is beautiful, and congratulations!!!! CONGRATS! Well deserved! LOVE your box! The crackle paint, the flowers, and the colors make one stunning creation! Wow!!! Gorgeous and useful. I want one like that! I have not lost any dies yet ,come close to it but found them again.However my biggest loss has been my Phone i think it must have fell out of my top jacket pocket as i leaned over the dustbin doh . Congrats!! You would be an asset to any team!! 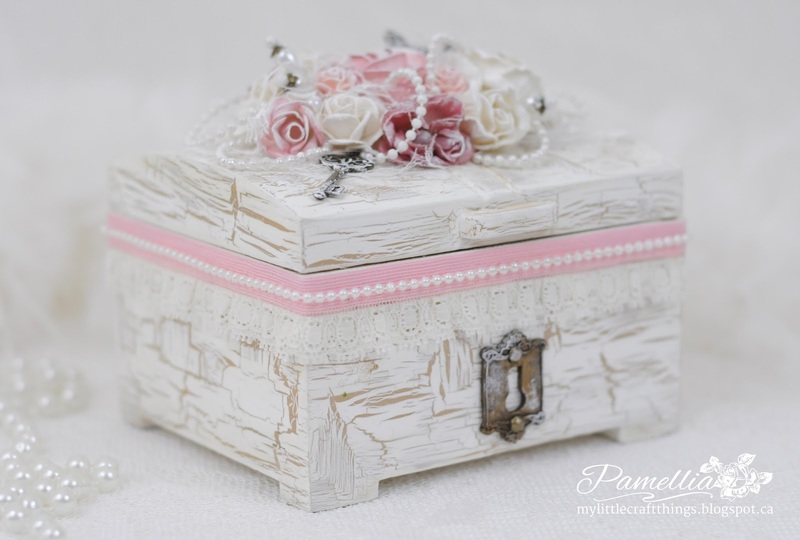 Loving this box ... so very beautiful and I don't miss any stamping ... it's perfect as it is ... And yep, me too ... dropped so much stuff in the trash and had to go looking for it ... Have a beautiful day! 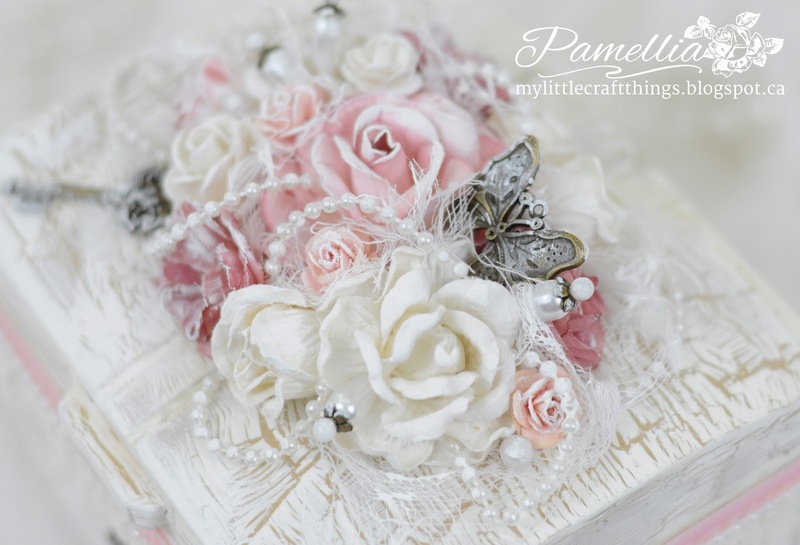 Oh I love this box Pamellia and what a fabulous idea! I've almost tossed a few dies myself! Gorgeous colors, flowers and I love the crackle effect... perfect sentiment too!! lol :D :D :D It's good he has you then. ;) My bf would do everything black and white. And while I do like black and white colour combination (mostly black though), I think there has to be a splash of *real* colour too (and waaaay more white than black). Congratulations on your new DT spot Pamellia. Such a beautiful project and so useful as well. 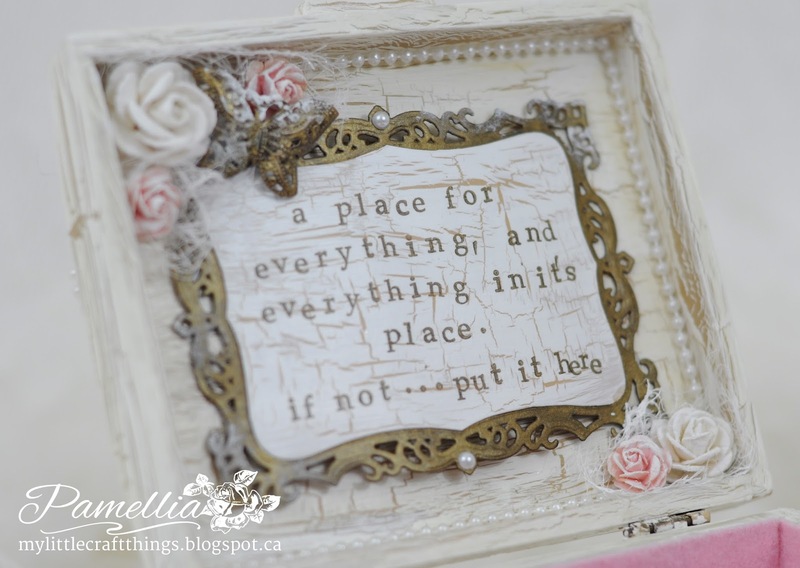 I love the paint effect and gorgeous floral embellishments - this will look wonderful on your craft desk. Wow, another absolutely gorgeous project! Your work is phenomenal! And congrats on this DT gig too! Love the dumpster-diving story! Teeheehee! Such a shabby chic beauty and your flower arranging has the wow factor. This is fabulous! I love the cracked texture and the pretty flowers and of course the lace. Thanks for joining us at Alphabet Challenges. Hi Pam! Your box is so gorgeous! A lot of work but so beautiful result! I 'm sure you won't keep it anymore in your closet! LOL! I loved reading this post! Your writing is as delightful as your art work. I could feel the joy you have in creating...and had to laugh at your "die box" saga. I have, sadly, done the same thing. But only once. I use magnetic heating vent covers (very cheap at the hardware store and they work great) and store them in a clear plastic shoe organizer that hangs on the back of my studio door. But enough about me...this box...shabbylicious! 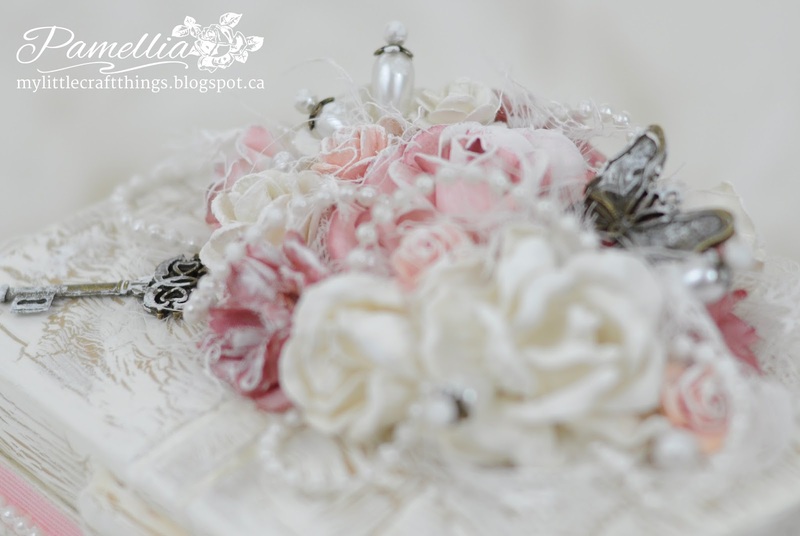 The crackle finish is divine, the handmade flowers are stunning, and I love the way you've used the pearls and lace. What a face lift! OH, and congrats on the new DT! They are lucky to have you! Oh wow this is stunning, absolutely love this box and your design is gorgeous. Thanks for sharing with us at Sugar Creek Hollow. Congratulations on the new DT !